Next year marks morphine's 200th anniversary as an analgesic (while it was discovered in 1804, it was first marketed to the public in 1817). 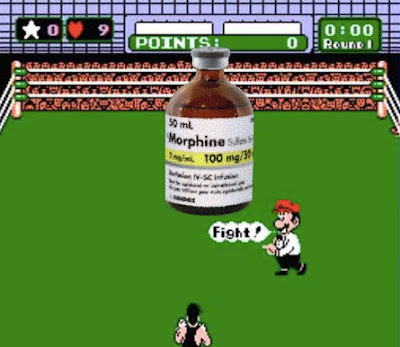 In honor of this historic event, I'm going to dedicate this GeriPal post to morphine by describing three recent trials that continue to show that morphine can hold its own when it comes to pain relief. The primary outcome of a pain reduction of 20% or more from baseline occurred in 88% of the low-dose morphine and in 58% of the weak-opioid group (odds risk, 6.18; 95% CI, 3.12 to 12.24; P,.001). The benefits of morphine over tramadol/codiene were evident as early as the 1 week observation point. Clinically meaningful (30%) and highly meaningful (50%) pain reduction from baseline was also significantly higher in the low-dose morphine group. A change in the assigned treatment occurred more frequently in the tramadol/codiene group, because of inadequate analgesia. Adverse effects were similar in both groups. This is just more evidence that morphine is a more effective mediation to reduce pain than tramadol and codeine. Combining this with other studies on the risks of tramadol, I’m not sure why one would ever chose these “weak opioids." I know I never do. It also calls into question the whole idea of a step II in the WHO analgesic ladder. This is a little bit older of a study (dates back all the way to 2015) but a great one from my point of view. It was a randomized control study looking at the the clinical response to oral morphine vs. oral oxycodone when used as first-line or second-line (after switching) treatment in patients with cancer-related pain. In the first part of this study, patients were randomized to either of these agents and the doses were titrated until the patient reported adequate pain control. If they didn't respond to the first-line opioid (either because of inadequate analgesia or unacceptable adverse effects) they were switched to the other opioid. They found no significant difference between the numbers of patients responding to morphine (62%) or oxycodone (67%) when used as a first-line opioid, or when used as a second line therapy when switching due to inadequate response to the first line therapy. Of most interest, over half of those who didn't respond to first line therapies got relief with the second line therapy, giving some much needed evidence to back up the practice of opioid rotations. What’s better, opioids or NSAIDs for pain control in patients with malignant pleural effusions? This non-blinded study looked at that question among 320 patients requiring pleurodesis in 16 UK hospitals from 2007 to 2013 (they also looked at the effects of different sizes of chest tubes, but I wont talk about that here). Patients with malignant effusions were all given acetaminophen around the clock and randomized to receive either oral morphine (starting at 10mg QID to max of 80mg/24 hours) vs ibuprofen (starting at 800mg TID to max of 2.4g/24 hours). In either group, if pain got to bad, patients could use IV morphine as a breakthrough. The authors of the study found that mean pain scores as measured by a 100 point visual analog scale were no different in the morphine PO group vs the NSAID group (mean VAS score, 23.8mm in opioid vs 22.1 mm in NSAID; adjusted difference, −1.5 mm; P = .40). However, the NSAID group required more rescue analgesia (38% in NSAID group and 26% in oral morphine). Adverse effects looked similar although the NSAID group had a statistically significant increase in creatinine that was clinically less significant (by 0.1 mg/dl). What am I taking from this study? Well, to put bluntly, there is little evidence that NSAIDs are better than opioids for for malignant pleural effusion pleurodesis, and even when you used them, a third of patients will still required morphine for breakthrough pain control. Eric, in the second study you cite, to what extent is there evidence that opioid rotation provided true benefit, as opposed to - dare I say it - regression to the mean in terms of pain control. That graphic though! Body blow! Body blow! 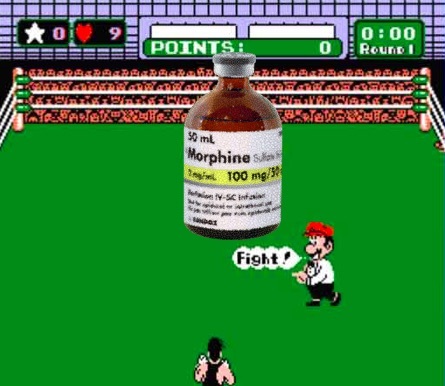 Uppercut! To the individual who dared to mention the term "regression to the mean" - you won this round. It would of been nice to have a group of non-responders who didn't switch to a new opioid to see what happened to their pain levels. Finally someone commented on the graphic. Thats Sinclair. That was my favorite part of the post!